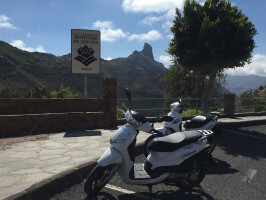 Do not miss the chance to explore tExplore the idyllic island of Tenerife snugly seated on a scooter and find yourself in the most magical of places often not discovered by tourists. Set out to acquaint yourself with the island in a fun and adventurous way! 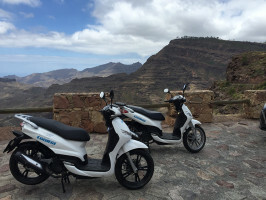 With over 100 locations in 5 countries, and the best prices, rent a scooter with Cooltra, and make your way to the most charming and curious places tucked away in a place that offers a climate and environment that is rather unique. 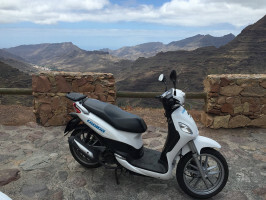 With this light and comfy mode of transport you can get around the island as you please. You will uncover hidden places that are often missed by the average tourist. You will save so much time when you need to find parking due to its size. Whether you are alone or not, rest assured a scooter will surely suit your needs! You must cover the costs of up to 500€ for damages and the insurance will cover the rest. You must cover the costs of up to 150€ for loss or damage and the insurance will cover the rest. If the vehicle is stolen, the insurance gives you full cover. Please bear in mind that you only need to put the names of the drivers when you make the booking. If you want to rent a scooter for one driver and one passenger, you only need to make the reservation for one person. If you want the vehicle to be for two drivers and one passenger: you need to make the reservation for just two people. You need a minimum of 3 years of driving experience or a valid license for a 125cc. The scooters can hold a maximum of 2 people. Minimum age 21 years and valid driving license in compliance with the Spanish legislation. Excess Reduction included (franchise reduction to 0€ in case of robbery and 150€ in case of damages).